When binary options first started to get big a few years ago, there was only one type of trade you could take, called High/Low, or Up/Down, or Call/Put. All of these mean the same thing. “Binary options” of course take the “binary” part of their name from the structure of these trades, since each has two possible outcomes. Since the explosion of public interest in binary options, however, a number of other types of trades have become available on binary options websites, and we are seeing more crop up all the time. What are all the different types of options you can trade when you open a binary options account? Let’s talk about each of these types of trades in detail. Binary options is becoming a very exciting world, replete with choices. If you believe the answer is “higher,” you simply pick “High” on your platform (or “Up” or “Call”). If you believe the answer is “lower,” you then pick “Low” on your platform (or “Down” or “Put”). The expiry time can vary, or it can be set by the trader when using “Option Builder,” which is a more customizable form of High/Low trading offered by many binary options brokers. The expiry time can range widely, but for High/Low trades, it will usually range from five to 15 minutes to sometime hours later on the same day. Intra-day trading used to be all that was offered by the majority of brokers, but that is starting to change with the integration of Long Term trading. If you are correct about your assertion and the asset is trading at the level you indicated when the clock runs out, you win your trade. Otherwise, you lose. One Touch trading works a little differently than High/Low trading. With One Touch trading, you are looking at a given asset, and you are asked a different question. The trigger point may be anywhere on the chart. Usually the further away the trigger point is from the current price level, the higher your potential payout if you win. A point which is located nearby is easier to reach, and therefore would pay out less since the risk is lower. If you say that the asset will touch the trigger point, and it does, anytime within the expiry period, you win your trade and the payout. If you are wrong, you lose your investment. One thing that is exciting about One Touch trades is that you will typically encounter much higher payouts for these types of trades. This is due to there being more risk associated with them. But that means whereas the average payout for High/Low trades might be close to 85%, your broker might offer you payouts ranging around 300% for One Touch trades. There are also variations on the One Touch trade, though not many brokers offer these. No Touch trades are just like One Touch trades, except that you are betting that price will fail to reach the trigger point. There are also Double One Touch and Double No Touch trades involving multiple values. Boundary trades, also known as Range trades, involve trading in a channel. One aspect of technical analysis which you will learn when you are studying how to trade is the concept of a channel in which price ranges. The upper and lower limits are determined by support and resistance. Price will test these limits and will generally stay inside them, though price will eventually pass these limits and enter into a new range. With a Boundary trade, you are essentially doing a Double No Touch trade. You are stating that price will stay within a certain range which is bounded by two trigger points. If price stays within that designated range during the entire trade, you win. If it passes outside that range (in other words, touches either trigger point) during the expiry period, you lose. What is great about Boundary trading is that it allows you to profit even in flat markets when price is staying relatively stable. Since you can only profit based on price movements in most trading situations, this is a unique opportunity in the binary options world which you will not discover elsewhere. Only a minority of binary options brokers offer Range trading, so if this is an opportunity which interests you, you will need to look for a broker which does offer you this type of trade. 60 Second trades have become extremely popular in recent months. They are now offered as commonly as High/Low and One Touch trades. Almost every binary options broker out there now offers them. These types of trades work exactly like standard High/Low trades which I talked about before, except that the action blazes by in just one minute. The expiry time for 60 Second trades is always one minute. There is nothing more thrilling than being in a trade with a chance to gain or lose it all that fast. Some binary options brokers also offer Short Term trades. These may include 60 Second options, but also options with two- or three-minute expiry times. Check out http://www.fastbinaryoptions.com/ for more information. A word to the wise: these super-fast options are not for everyone. You can make a great deal of money this way if you are skilled at working with small timeframes and acting fast, but the majority of traders who jump into these trades without planning and testing will discover that their money is gone in 60 seconds. Do some demo testing first to make sure that this type of trading is right for you! One of the most exciting types of trades which I have only recently noticed binary options brokers providing is Long Term options. These options are just the opposite of 60 Second options. Instead of being designed to last a very short time period, they are designed to unfold over days, weeks, or even months. You will find a variety of expiry times available. That is a typical reaction from binary options newbies, which is the reason that this type of trading has not really taken off. Nonetheless, you will find more and more brokers making these longer expiry times available. So this begs the question: why would you want to sit around in a trade for weeks or months? Long Term trading doesn’t exactly offer up fast-paced action. The harsh reality of the matter is this: the majority of traders who start on fast time frames will fail. Outside of binary options trading, it is far more common for traders to start out with trades that they are in for several days at a time. It is easier to learn with these slightly longer trades for a couple of reasons. Firstly, it is easier to correct mistakes in your trading when you are less tempted to blow all your money within the same hour. Secondly, the data at these levels is more reliable and therefore easier to base successful trades off of, which is excellent for technical analysis and price action traders. Another reason that Long Term trading is something you should think about is that not everybody has the personality for Short Term trading. A lot of traders will be happier and more successful when trading across several days or a week. Others still will do best with position trades that last for weeks or longer. Ladder trades are also a relatively recent invention. These are some of the more complicated types of trades you will find on binary options websites. They have an “interval” setup with several different strike prices. Ladder trading allows you a shot at making partial profits with trades which are likely to encounter significant support and resistance. There are also several different expiry prices along the way. You are allowed to choose both the strike prices and the expiry times. Ideally, price will progress along the “ladder” of strike prices and expiry times at the exact rate that you say that it will. Each time a strike price is reached within the expiry period that you designate, you will receive a partial payout. Together, these payouts can add up to far more than 100%. A Ladder trade is not really all that different from a High/Low or One Touch trade. You are still fundamentally looking at an asset and saying which direction you expect it to move and within which timeframe. You are breaking down the trade, which allows you to have partial wins and losses. This type of trade is for advanced traders, and it will probably take you some time to learn how to execute it profitably. Pairs trading has been around for a number of months now. StockPair was the first broker to offer this type of trading. They built quite a reputation around it, since it was a very popular way to trade. Other brokers soon started following suit, and now many different binary options companies offer this type of trading (though StockPair is still among our highest broker recommendations). You would pick Google in this case, and if you were right, you would win your trade. If you were wrong, you would lose your investment. What if both stocks are actually falling? 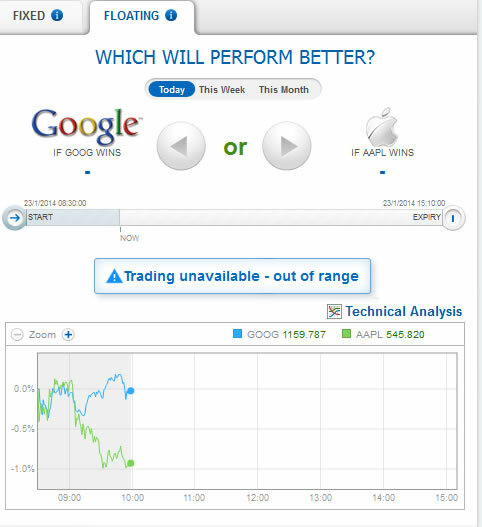 You still win, as long as Google is faring better than Apple at the end of the expiry period. Even in a bearish market, you can win, as long as you are correct about the relative performance. This is an exhilarating type of binary options trade, and it is becoming more common. Now you have the complete rundown on the types of binary options trades which are available. Binary options companies are very innovative, and odds are within a few months, we will see even more new types of trades beyond these seven. In the meantime, you have many different opportunities to make money on binary options sites. No matter what your trading personality is, you will find one or more types of trading which suit you to perfection, and which enable you to turn a healthy profit. Research what types of options a broker provides before you invest your money, since not every broker offers every type of trade. Read more criteria for choosing a broker here.